Packed with fresh fruit and topped with an irresistible almond crust, this grain-free peach cobbler will have everyone coming back for seconds. 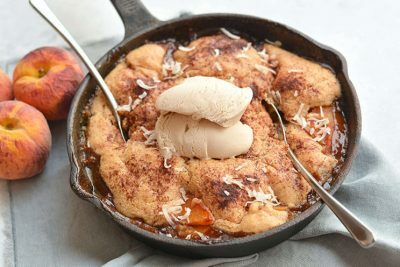 This recipe is a healthy twist on peach cobbler and swaps the processed gluten flour with Paleo-friendly almond flour. With wholesome ingredients you can feel good about eating, the almond flour creates a cinnamon-y, fluffy layer over a bed of sweet peaches. When baked together, the layers bubble and the flavors marry into a decadent dessert. The almond flour is the perfect topping for the cobbler. It gives it a nutty flavor and crumbly texture that’s crucial for any cobbler recipe. The peaches shine through the flaky cobbler topping with their sweet and juicy flavors. A bit of coconut sugar and shredded coconut are added to brighten the sweetness. If you’re a fruit lover, add a cup of chopped nectarines and blueberries to create a spunky blend of bright flavors. 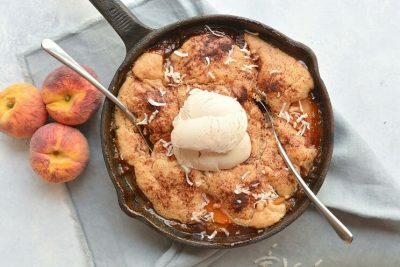 Eat your peach cobbler warmed in the oven for dessert or with coffee in the morning (I love eating it right out of the skillet!). Sprinkle the top of the cobbler with cinnamon and shredded coconut, and serve with whipped Paleo coconut cream or non-dairy ice cream! Packed with fresh peaches and topped with an irresistible almond crust, this grain-free dessert will have everyone coming back for seconds. Preheat oven to 375°F. Grease a 9-inch skillet lightly with coconut oil. In a medium bowl, combine all ingredients for the peach layer. Pour the peach mix into the prepared skillet, spreading evenly. In a separate bowl, combine all ingredients for the cobbler layer. Place large spoonfuls of the cobbler mix over the peach layer. Bake for 25 minutes until bubbly and a toothpick inserted into the cobbler layer comes out clean. Remove from oven and top with cinnamon and coconut flakes. Tip: Serve warm with coconut milk ice cream!